The 5-IN-1 interchangeable Storm Fighter jacket with removable inner jacket allows you to use both the shell and inner shell with insulated liner during any season. Both Outer and Inner shell are made from 300D Oxford 100% polyester with a polyurethane coating. Both layers include 4 inch two tone tape that meet CSA Z96-09 Class 2, Level 2 requirements and meet the Class 3 configuration when worn with the Storm Fighter Hi-Viz Bib Pants. Additional features include mesh lining, multiple pockets, chest pocket, ID window, Kidney warmer back, side zippers for quick access to bib pant pockets, adjustable elastic wrist, heavy duty zippers, and a roll away adjustable hood. Inner jacket also features removable arms and a reversible black shell. Powered by M12 REDLITHIUM Battery Technology, the Milwaukee<sup></sup> M12 Heated Women's Jacket uses carbon fibre heating elements to create and distribute heat to the back, collar, and front hand pockets. Featuring a quilted softshell design and high-loft insulation, the jacket provides wind and water resistance while trapping heat to provide extended warmth and comfort in cold conditions. The small black MILWAUKEE M12 Heated AXIS jacket is designed to protect from cold and weather on the jobsite. Powered by M12 REDLITHIUM Battery Technology, these heated jackets use carbon fiber heating elements to create and distribute heat to the chest, back and shoulders. A single touch LED controller heats up the battery heated jacket to three heat settings, creating a comfortable heat for any environment. This MILWAUKEE heated jacket has a new Quick-Heat funtion that creates and distributes heat three times faster than our previous jackets and market competitors. Hybrid AXIS Ripstop Polyester provides a lightweight, compressible design that can be used as an outer shell or a mid-layer jacket and provides wind and water. The women's MILWAUKEE M12 Heated AXIS jacket kits are designed to protect from cold and weather on the jobsite. Powered by M12 REDLITHIUM Battery Technology, these heated jacket kits use carbon fiber heating elements to create and distribute heat to the chest, back and shoulders. A single touch LED controller heats up the battery heated jacket to three heat settings, creating a comfortable heat for any environment. This MILWAUKEE heated jacket kit has a new Quick-Heat function that creates and distributes heat three times faster than our previous women's jackets and market competitors. Hybrid AXIS Ripstop Polyester provides a lightweight, compressible design that can be used as an outer shell or a mid-layer jacket and provides wind and water. This kit comes with one heated women's jacket, an M12 battery and charger. Storm Fighter supported pvc on polyester rainwear offers heavy duty quality at an affordable price. This 3-piece suit, which includes bib pants, jacket, and a detachable hood is waterproof, heat sealed with welded seams. 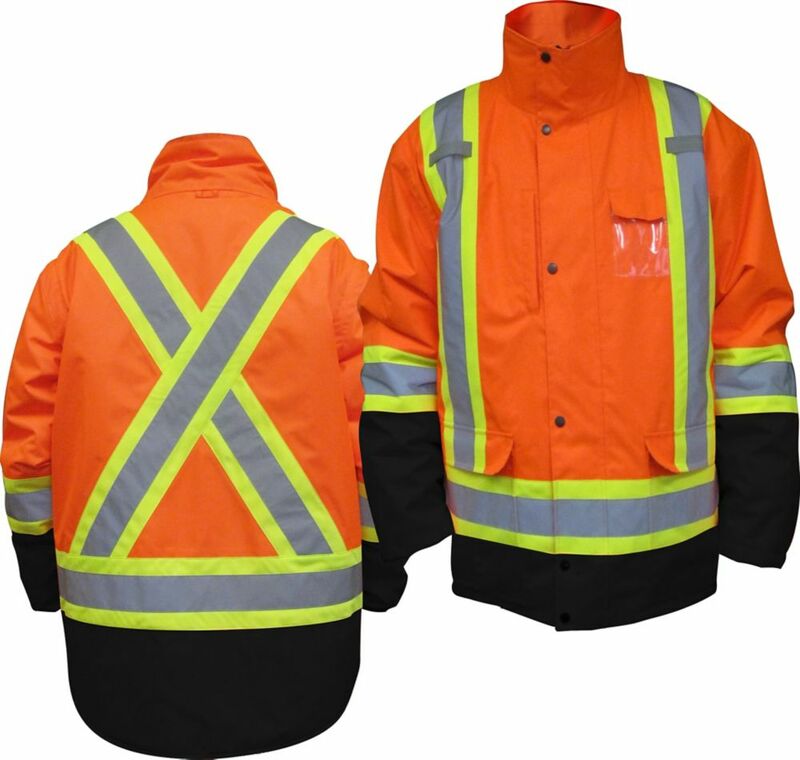 HIGH Viz Parka 5 In 1 Orange XLarge The 5-IN-1 interchangeable Storm Fighter jacket with removable inner jacket allows you to use both the shell and inner shell with insulated liner during any season. Both Outer and Inner shell are made from 300D Oxford 100% polyester with a polyurethane coating. Both layers include 4 inch two tone tape that meet CSA Z96-09 Class 2, Level 2 requirements and meet the Class 3 configuration when worn with the Storm Fighter Hi-Viz Bib Pants. Additional features include mesh lining, multiple pockets, chest pocket, ID window, Kidney warmer back, side zippers for quick access to bib pant pockets, adjustable elastic wrist, heavy duty zippers, and a roll away adjustable hood. Inner jacket also features removable arms and a reversible black shell.